A hub airport in the Thames Estuary is not a solution to the South East’s airport capacity problems in the foreseeable future – according to an independent report received by the South East Local Enterprise Partnership. They say that expanding use of other airports serving the South East (including Stansted, Southend and Manston) could address short term business needs, and also increasing use of Heathrow, Gatwick and London City (which would not be acceptable to local residents there). The LEP report says that due to the effect it would have on Heathrow, a Thames estuary airport is not a feasible solution. 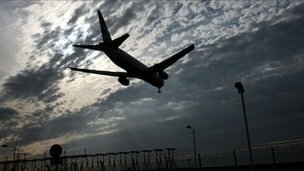 A Thames estuary airport will not solve short-term air capacity problems in the UK, an independent report has said. The report, commissioned by the South East Local Enterprise Partnership (LEP), said an estuary airport would be too expensive and would take too long. LEP chairman John Spence said: “As the country’s economic powerhouse, the South East needs a transport infrastructure that helps business grow and flourish. “This report shows us that business traffic is already being lost to the UK. “It confirms the need for new capacity in the long term but the immediate need is for better utilisation of the capacity we have. Former Medway mayor and director of Demand Regeneration in North Kent (Drink) Dai Liyanage said Gatwick expansion could not happen for another seven years because of a legal ruling. Mr Liyanage said the need for jobs in the area outweighed the potential environmental damage of building an airport in the estuary. “There are a lot of young people in the Medway towns who are unemployed, who have got no hope whatsoever for the future, and here is something. “Within 10 years’ time they will have a new airport, new jobs and a career and a future,” he said. The report said expanding other airports including Stansted, Southend and Manston could address short-term business needs, and significant potential was available by increasing use of Heathrow, Gatwick and London City airports. It said a Thames Estuary airport was not feasible because of issues including cost, air space management, the time it would take to build it and the impact it would have on Heathrow. The LEP will use the report to help shape its response to the forthcoming government consultation. In its coalition agreement, the government said it would cancel plans for a third runway at Heathrow and refuse permission for additional runways at Gatwick and Stansted. Two plans have been put forward for Thames estuary airports – one on an artificial island, known as “Boris Island” because it has been backed by London Mayor Boris Johnson, and another by architect Norman Foster, who has proposed building a £150m airport on the Isle of Grain. In response, a Department for Transport spokesman said: “This summer we will consult on a new aviation policy framework which will set out our overall aviation strategy. “Alongside this, we will issue a call for evidence on maintaining the UK’s aviation hub status. A hub airport in the Thames Estuary is not a solution to the South East’s airport capacity problems in the foreseeable future – according to an independent report received by the South East Local Enterprise Partnership (SELEP). However it found that due to a wide range of issues including cost, air space management, the time it would take to build and the impact it would have on the current Heathrow site, a new hub airport in the Thames Estuary is not a feasible solution. Chairman of the South East LEP, John Spence, said: “As the country’s economic powerhouse the South East needs a transport infrastructure that helps business grow and flourish. This report shows us that business traffic is already being lost to the UK. “It confirms the need for new capacity in the long term but the immediate need is for better utilisation of the capacity we have. We do not believe that a hub airport in the Thames Estuary is a viable short or medium term solution. A summary of the Parsons Brinckhoff report can be found here In developing their report Parsons Brinckhoff spoke to over 110 individuals and organisations including business representatives, airlines, airport owners, and political representatives.